Samaritan PAD 500 er hálfsjálfvirkt hjartastuðtæki þ.e þá þarf að ýta á stuðrofa tækis til að gefa rafstuð. Tækið talar til notandans og gefur fyrirmæli á íslensku (hægt að fá með ensku tali). Tækið er búið búnaði sem veitir nákvæma endurgjöf um hjartahnoðið. Endurgjöfin felst í leiðbeiningum um hvort hjartahnoði sé rétt beitt þegar kemur að dýpt og hraða. Tækið er búið myndum og táknum sem lýsast upp þegar við á, sem auðveldar notkun þess. Með tækinu fylgir burðartaska, hleðslurafhlaða og rafskaut. Rafskautin sem fylgja tækinu er ætluð til notkunar á fullorðnum og börnum sem hafa náð 8 ára aldri. Hægt að er kaupa sérstök barnarafskaut fyrir börn yngri en 8 ára. Endingartími rafhlöðu og rafskauta eru 4 ár. Ábyrgðartími tækis eru 10 ár. Compact and lightweight. Up to 56% smaller than other AEDs on the market and weighs only 2.4 lbs (1.1 kg). Highest level of dust/moisture protection. The samaritan PAD has a rating of IP56, providing the SAM 500P defibrillator with the highest level of protection from dust or moisture ingress in the industry. Advanced technology. The samaritan PAD 500P utilizes proprietary electrode technology, advanced and stable firmware, and proprietary SCOPE™* Biphasic Technology (an escalating and low-energy waveform that automatically adjusts for patient impedance differences) to assess rhythm and maximize effective shock delivery if necessary. User-friendly. 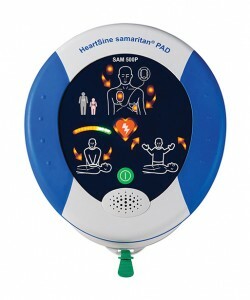 The samaritan PAD 500P features easy-to understand visual and voice prompts that guide a user through the process. Three large, easy-to-see icons facilitate the rescue process: “Attach pads,” “Do not touch the patient,” and “It is safe to touch the patient”. Protects both adults and children. The HeartSine PAD’s built-in intelligence and unique Pediatric Pad-Pak, which is available for 1-8 years of age (<25 kg or 55 lbs), ensure the appropriate energy level is delivered for children. CPR Advisor is automatically turned off when a Pediatric Pad-Pak is used. Field upgradeable. Easily upgraded in the field to the latest AHA/ERC guidelines. Temporary Transportation Temperature: –10°C to 50°C (14°F to 122°F) for up to two days.Unit must be returned to standby/operating temperature for 24 hours before use. samaritan PAD 500P: ABS, Santoprene. Printed circuit board with electronic components.